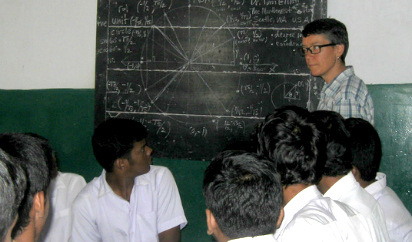 In January 2012, T. Thomas Elliott, a math teacher at the Northwest School, left Seattle with her family to spend three and a half months in Kerala, India as part of the Fulbright Distinguished Awards in Teaching program. This program provides U.S. and international teachers the opportunity to pursue individual projects, take courses for professional development, and lead classes and seminars for teachers and students at a university and local schools. As part of the application process, Dr. Elliott proposed a project on solving problems by using games for small groups. Maybe some will now be inspired to change that. Gain a Competitive Edge: Learn Hindi in India!